"Complete this made-in-minutes meal with Fruit Medley. 'This recipe is an adaptation of a fruit salad from my husband's aunt,' says Becky Hughes of Las Cruces, New Mexico. 'The original recipe calls for a homemade glaze, but I use canned peach pie filling to hurry along preparation." 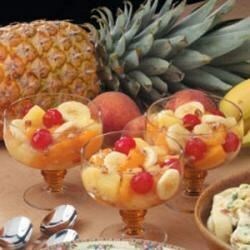 In a bowl, combine the pie filling, pineapple, oranges, cherries and bananas. Cover and refrigerate. Just before serving, stir in pecans. I love this recipe. Only thing I do different is add strawberries instead of cherries. Took to a party last night and received many compliments and recipe requests. So good and easy! My jar of pie filling was 32 oz. and was just fine.